Authorities from the National Penitentiary seized drugs, beer and guns from a hidden tunnel inside one of the cells there. The police action began at eleven o’clock on Wednesday night and lasted until two o’clock yesterday. In the tunnel that was five feet deep and three meters long, the inmates had stashed 75 cases of beer and several bottles of liquor. Authorities also seized four knives, a thin jacket, marijuana, two hacksaws, six mobile phones, three magazines, nine empty liquor bottles, a pair of police boots, lingerie, and keys. 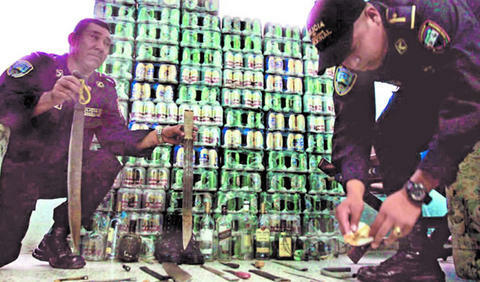 This is the first time a large quantity of alcoholic beverages were confiscated. Authorities are still investigating everyone involved. The agent explained that the 75 boxes of beer (1,800 cans) had a value close to 50,000 lempiras. The key to handcuffs were seized from one of the inmates. Prison authorities assured that security measures will increase, as they will not continue to allow this type of activity.